Our house made Corned Beef with sauerkraut, & Swiss cheese rolled in a crispy shell with thousand island. Mozzarella cheese wrapped in a thin wonton. Served with marinara sauce. A Boneyard Original. Diced chicken, Cream Cheese & our own Garlic Buffalo Sauce inside a crispy wonton. Thick cut sweet onions dipped in beer batter & deep fried. A supreme version of this timeless classic. Fresh Wisconsin Cheddar cheese curds hand battered & fried to irresistible bites you just can’t stop eating. Lightly battered & deep fried for a crispy taste sensation straight from the garden! Thin sliced dill pickles, lightly battered & deep fried. Soft and chewy pretzel sticks served warm with your choice of Nacho Cheese, Buffalo Cheese or Gouda Cheese dipping sauce. 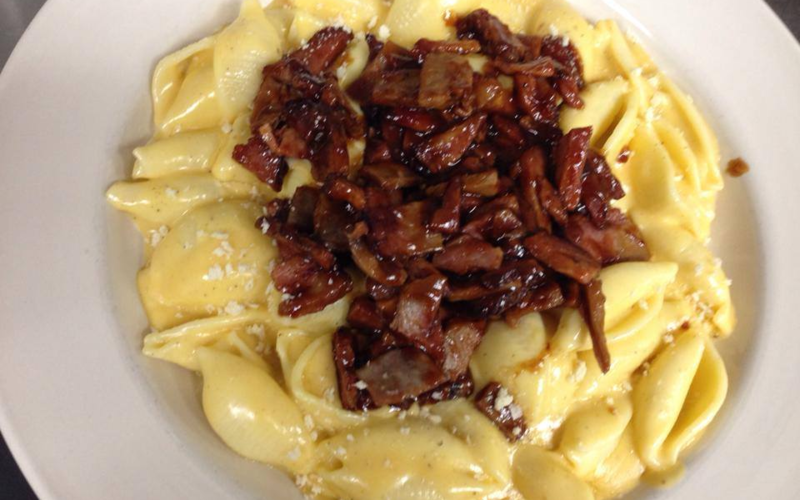 Macaroni with Romano, Parmesan, American, aged white Cheddar, cream cheese, Fontina, Cheddar and smoked Gouda! Tasty grilled chicken strips on a bed of mixed greens with onion, tomatoes, black olives, Parmesan & Cheddar cheese. Tasty crispy or grilled chicken on a bed of mixed greens with onion, mandarin oranges, chow mien noodles, Cheddar cheese & Asian dressing. A crispy shell filled with lettuce, shredded chicken, onions, tomatoes, black olives and Cheddar cheeses. Delicious grilled salmon filet on a bed of mixed greens with shredded Cheddar cheese, onion, tomato, cucumber & capers. Grilled chicken over a bed of fresh Romaine, Caesar dressing, Parmesan cheese & croutons. Cajun Alfredo sauce on penne pasta topped with our blackened chicken breast, tomato, onion & Parmesan. Served with breadstick. 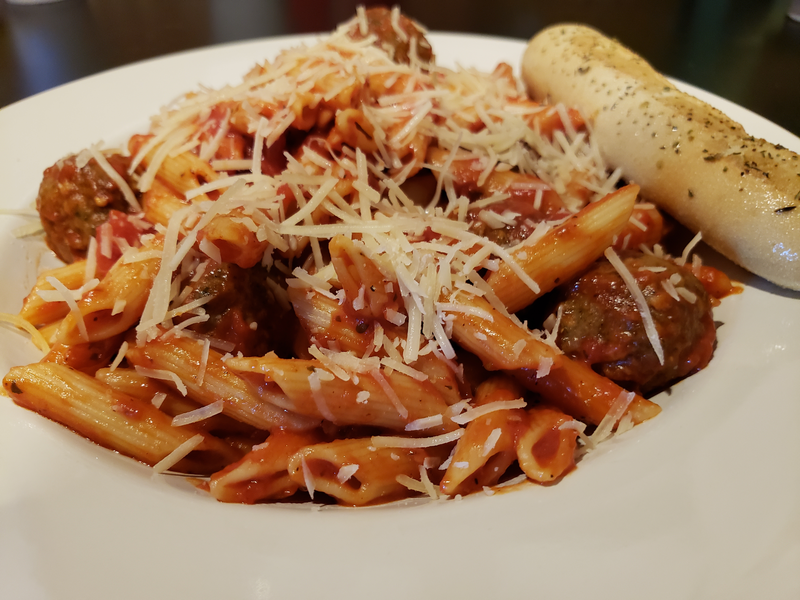 Penne pasta with marinara sauce, meatballs, parmesan & breadstick. Our boneless wings coated in your choice of sauce. 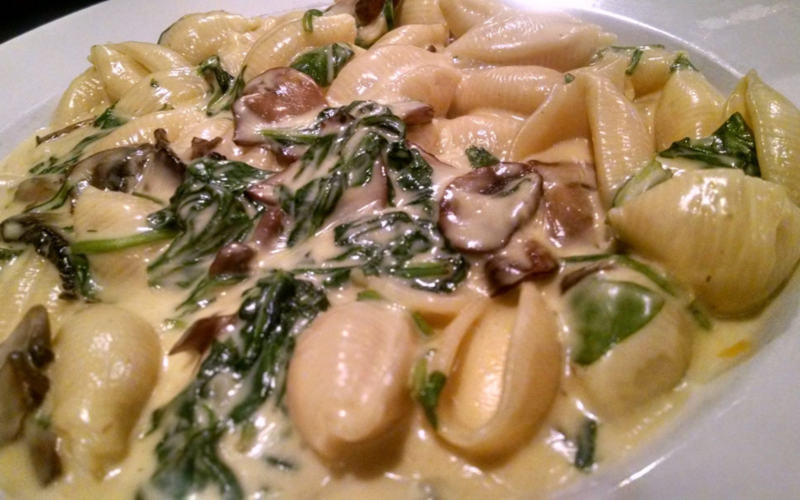 Smoked Gouda, Gruyere, Muenster & American Cheeses make up this savory dish. Topped with bread crumbs. 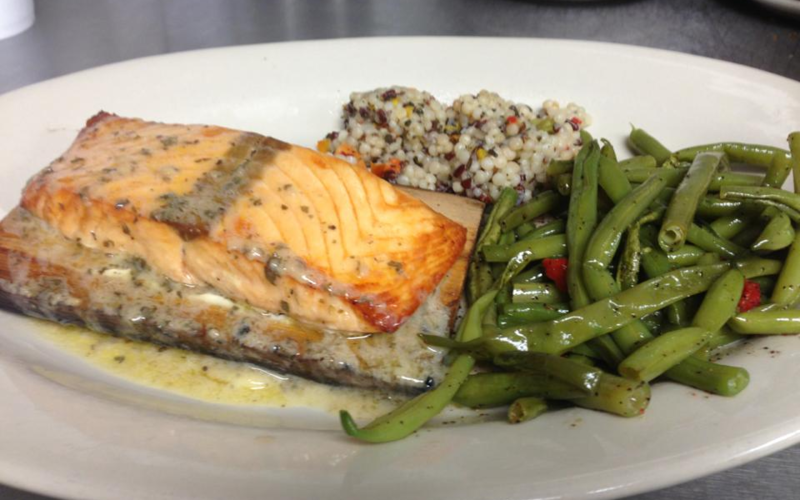 A bourbon marinated Salmon filet, grilled to perfection, served over rice pilaf & served with mixed vegetables. Our own homemade premium grilled meatloaf. Served with choice of side, corn bread & coleslaw. 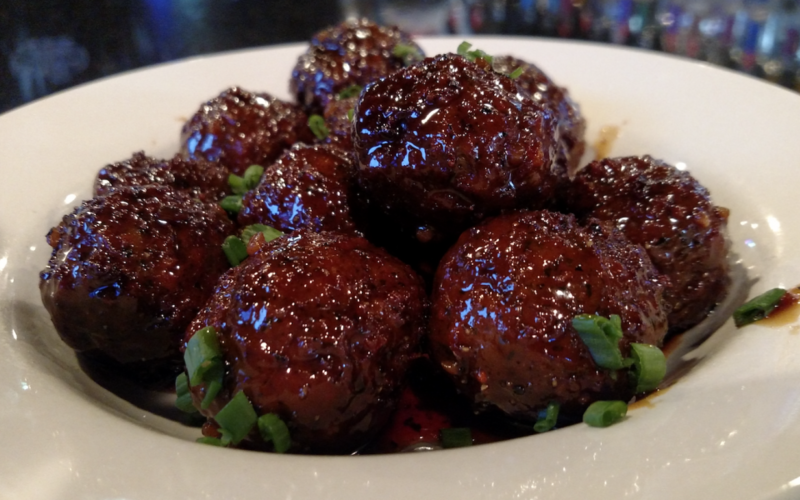 Add barbecue sauce for a new twist on meatloaf. A marinated chicken breast, grilled & smothered in bourbon glazed onions, mushrooms, red & green peppers and Provolone cheese. Served with choice of side, corn bread & coleslaw. Our Ribs were voted the best in SE Wisconsin! Our tender pork ribs are cooked in house & then grilled to perfection with your choice of special sauce. So tender they fall right off the bone. Served with coleslaw, corn bread & your choice of side. Like no other, we hand bread whole fresh chicken tenders and fry them to perfection. Sandwiches Served with potato chips or one of our Upgraded Sides. Coleslaw also available on request. Our house made grilled meat loaf, applewood smoked bacon & drizzle of chipotle barbecue on a grilled ciabatta roll. Sliced turkey with bacon, Cheddar cheese, lettuce, tomato, onion, & honey mustard sauce on a pretzel roll. Mozzarella, Provolone and American cheeses on Italian bread. Cajun beer battered shrimp, lettuce, tomato & a spicy remoulade sauce on a toasted French roll. A tasty hand breaded cod filet, with Cheddar, lettuce & tartar sauce. Our house made corned beef, sauerkraut, Swiss cheese & thousand island on a grilled rye. Prime Rib sliced thin on a fresh French roll covered in caramelized onions & horseradish cream sauce. Apple wood smoked bacon, avocado, cucumber, arugula, tomato and garlic bacon aioli served on a fresh ciabatta roll. Tender roasted pork pulled from the bone & topped in your choice of special sauce. Our slow cooked sliced Prime Rib, smothered in bourbon glazed onions, mushrooms, red & green peppers and provolone cheese on a ciabatta roll. Mozzarella, Provolone, Parmesan and American cheeses on Italian bread. Shredded Chicken, Pepper Jack cheese, sautéed onion, red & green peppers on Italian bread. Sliced Prime Rib, Mozzarella cheese, sautéed onion on Italian bread. 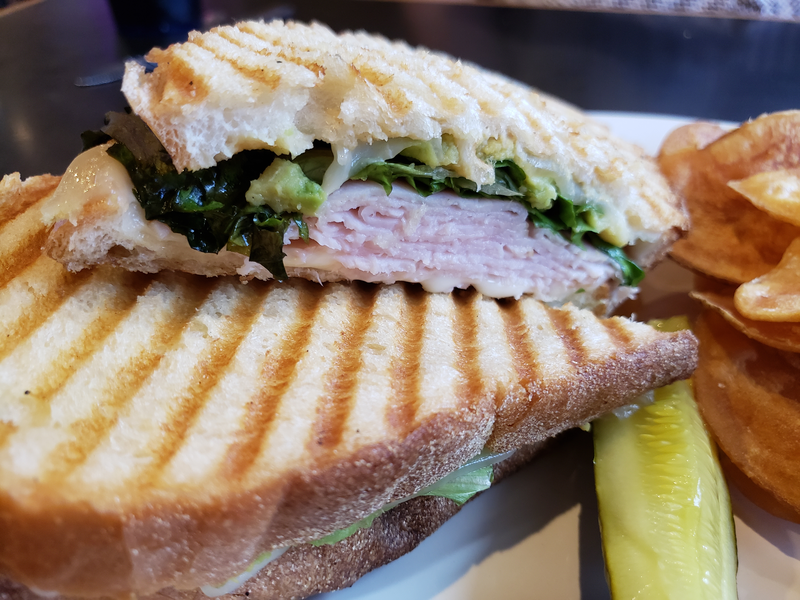 Turkey, avocado, arugula, Dijon mustard and mozzarella on Italian bread. Our house made corned beef, sauerkraut, Swiss cheese & thousand island on a rye. Crispy Chicken, Mozzarella, Provolone and Parmesan on Italian bread. Tomato, bacon and Mozzarella cheese on Italian bread. Pulled Pork in your choice of special sauce, crispy onion straws & Cheddar cheese pressed on Italian bread. Burgers & Chicken Each of these Signature Burgers come in your choice of our premium burger or grilled chicken. All our burgers are hand made with a half pound of fresh Angus Ground Chuck and served with potato chips or one of our Upgraded Sides. Coleslaw available on request. Gluten Free Buns available for $1.00 up charge. No other Substitutions. Fried egg, sautéed onion, bacon, potato pancake, Cheddar & Bang Bang sauce on a brioche roll. Onion Strings, BBQ Sauce, Bacon & Cheddar cheese on a pretzel roll. Our signature- topped with bacon, jalapeños, sautéed onion, & Pepper Jack on a brioche roll. Smothered in bourbon glazed onions, mushrooms, red & green peppers and Provolone cheese on a brioche roll. Your choice of Cheddar, Swiss, Pepper Jack, Mozzarella, Provolone or American Cheese. Topped with lettuce, tomato, pickles and red onion. Caramelized onions & Cheddar cheese on Marble Rye. Cajun seasoned, sautéed mushrooms and onions, Dijon mustard & Bleu cheese on a ciabatta roll. Arugula, red onion, avocado, jalapenos, Chipotle BBQ & Pepper Jack cheese on a ciabatta roll. Avocado, Bacon, lettuce, sautéed onion, Sriracha Bourbon sauce & Cheddar cheese on a pretzel roll. Crispy onions and horseradish sauce on a brioche roll. 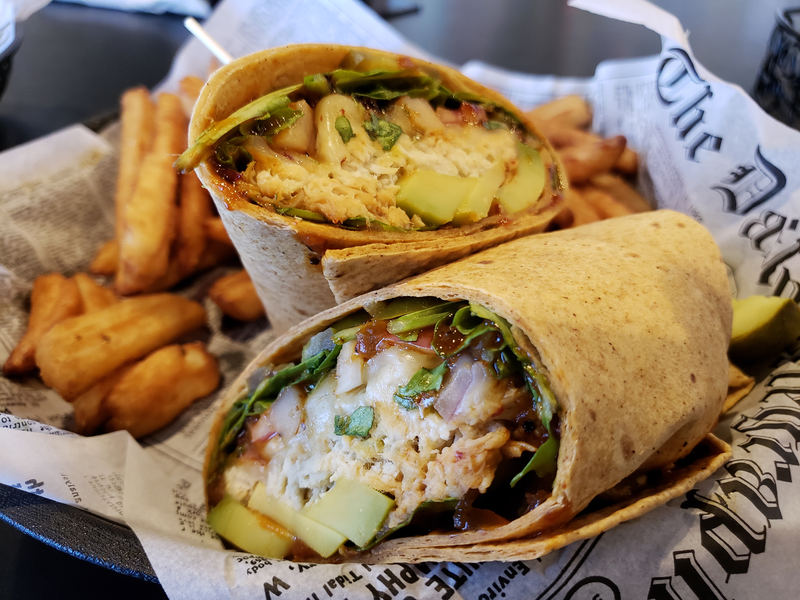 Wraps Served with your choice of flour, chipotle or spinach tortilla, and served with potato chips or an Upgraded Side. Coleslaw available on request. Premium applewood bacon, lettuce, tomato & mayo. Grilled or crispy chicken, mandarin oranges, chow mien noodles, lettuce, shredded Cheddar cheese & Asian sauce. Sliced turkey, avocado, lettuce, tomato, onion, Cheddar & roasted garlic sauce. Our tasty grilled salmon wrapped with rice pilaf, bourbon glazed onions, mushrooms, red & green peppers and provolone cheese. Grilled or crispy chicken, romaine, Parmesan, bacon & Caesar dressing. Grilled or crispy chicken, pineapple, jalapeños, Pepper Jack, & jerk sauce. Grilled or crispy chicken smothered in our own Boneyard beans, pepper jack cheese, & barbecue sauce. Grilled or crispy chicken, lettuce, onion, tomato, shredded Cheddar, & your choice of special sauce. Slices of turkey & ham, Cheddar cheese, lettuce, tomato, onion, & mayo. Sliced beef, onions, mushrooms & green peppers and provolone cheese. Pulled Pork in your choice of special sauce, coleslaw, crispy onion straws & Cheddar cheese. Beer battered shrimp, avocado, lettuce, green onion & our Bang Bang sauce. Shredded Chicken, arugula, red onion, jalapeno, Chipotle BBQ & Pepper Jack cheese.